Decks are no longer just 10’ x 10’ squares made of low grade lumber. Decks are an extension of your living space, a focal point, and a place where you will spend considerable time. Deck design and building has become more complex due to increasingly stringent building codes, the limitless amount of decking and railing materials to choose from, and the countless features that can enhance your outdoor experience. What is the Budget for Your Custom Deck Building Project? A budget is imperative to help us create an accurate estimate for a custom deck project that will suit your needs. Just like purchasing a home or a new vehicle, your investment is more effective when you budget. As local deck builders in Halifax, All-Craft understands the industry and can design the project around your specific budget. Are There any Zoning Restrictions on Your Property? Every house has front, side, and rear setbacks that will determine how close you can build to your property lines. Every lot also has a maximum amount that can be covered by structures. Lot coverage becomes more relevant as lot sizes continue to decrease, and house sizes continue to increase. Have You Checked with Your Home Owners Association? Your Home Owners Association (HOA) has specific requirements in place regarding deck building. Restrictions on deck size, design, and materials are not uncommon. Prior to building, it is important to verify what your HOA requires. This is often overlooked by other decking companies! What are your unique tastes, what is your lifestyle, and how will that change the way you use your custom deck? Where’s the best place for steps? How much traffic will the deck be getting? How much space will you need to allocate for a table, chairs, or other furniture? Will you need additional space for a BBQ grill? What’s the best location for your BBQ grill? What are your expectations of the decking and railing materials? What does a deck warranty cover? How will your deck utilize Nova Scotia’s beautiful outdoor views? How will your deck affect the view from the inside of your home? How can you make the deck compliment your home? What’s the value of your home now, and how much value would a deck add to your home? Do you plan to sell your home in the near future? A new deck is an investment of your money into your home. Don’t entrust this investment into the hands of anyone other than a professional deck builder or contractor who has your best interests in mind! During the deck planning stage, try to keep only the budget, deck design, and aesthetics in mind. Details such as structure and footing locations will be determined after the deck planning process is complete. All-Craft can quickly assess quantity and proper materials required for the structure of the deck. If your dream deck features a sunroom, learn more about sunroom additions. Are you replacing an existing deck? Expanding on your current deck? Or is your yard a blank canvas? Whichever situation you’re in, you will want to establish a plan for the entire outdoor space that incorporates things such as landscaping desires. Opting to design a larger deck does provide you with more options, for example: tiered levels. When it comes to building a custom deck, functionality is key! A multi-level deck with multiple angles and stairs may look good on paper, but once built, a more complex deck can create problems with the placement and size of patio furniture and other accessories. It’s important to try to incorporate the furniture and accessories that you desire into the design process in advance. This will help you save time and money, as you will not have to shop for something that will fit the deck after it is already built. It is beneficial to consider how you will use the deck to entertain. We will work with you to ensure the size of deck, tiered levels, and placement of furniture allows for easy movement and spacious seating for your friends and family. Whether you’re looking to host large parties, or enjoy time with that special someone, a deck should complement your home and lifestyle. Planning for functionality is especially important when undergoing pool deck design and building, or hot tub deck design and building. The most common mistake made in stair planning occurs when what looks good on paper isn’t suitable for the conditions of the site. The height from finished grade or finished landscaping to the top of the deck will determine how many stairs you have. A good example is that you may like the idea of having a 2″ step/3″ rise on your drawing, but the height is 25″- 30″. With a 30″ height, you would have to have a 3″ step/4″ rise set of stairs. Each rise would then be 7 1/2″, which is a perfect height. Stair rise should be kept between 7″ and 8″. Anything above 8″ feels uncomfortable or like a chore to walk up. A rise below 7″ sometimes feels like stumbling or short stepping up the stairs. All-Craft is a Certified Ageing in Place Specialist (CAPS). We understand the sensitivity that is necessary when designing accessibility features such as wheelchair ramps. We design and build using specific building requirements and can also apply our own creative design, which ensures the new features blend in with the overall design of your outdoor living space. If you would like to include an accessibility feature such as a wheelchair ramp in your deck design, please contact us and we will go over all the necessary requirements. Once you’ve undergone the design, planning, and functionality phases of a deck build, it is time to think about deck material! Forget about the structure for a moment and think of the finished product – what is aesthetically pleasing to you? Many of our materials require low maintenance and will look great for long periods of time. However, some people opt against the low maintenance materials, simply based on the price. A couple of things to keep in mind when selecting materials are: What will it cost to stain the deck every year or two? What is the life expectancy of a wood deck vs a low maintenance deck? Right now, there are low maintenance manufacturers offering 25, even 30-year warranties on their products. Low maintenance decking material, such as composite decking, is a much more durable product, and in some cases, a heavier product, thus increasing the specifications and cost of the structure. In comparison, a treated deck is less expensive but will not last nearly as long as a deck made of low maintenance materials. When shopping for deck materials, it is important to keep in mind that you get what you pay for! Do you want to have the underneath your deck closed off? It may look good, but if you are low enough to the ground it may not be necessary. A popular option is to use the space as storage for your lawn mower or other yard maintenance equipment. 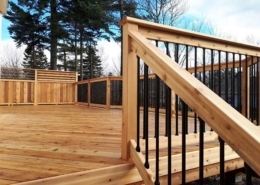 Once the deck is designed, it’s time to select your style of railing! 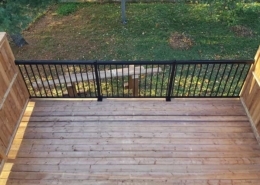 If you decided to build a treated deck, you can choose either a treated, or low maintenance railing. If you chose to build a low maintenance deck, it is now a decision of what kind of low maintenance material to use. 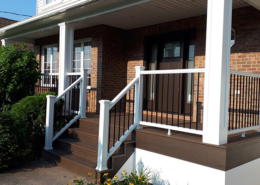 An aluminum railing is a popular choice and has various colours and spindle options available. Low maintenance decking manufacturers also supply matching rail systems which are very attractive. If you are looking for elegance, or wish to show off a stunning landscape, glass railings may be the way to go! The structure of any deck is determined by Nova Scotia Building Codes. 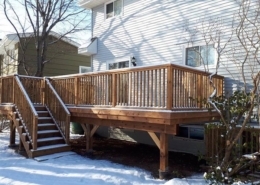 It is important to review and comply with the City of Halifax licenses and permits when building a custom deck, and to also fill out the application form and deck construction detail sheet. This is a step All-Craft Decks & Sunrooms takes care of for all clients. If you have any questions or are looking for a deck building quote in Halifax, please contact us today!